Listening to NASCAR race broadcasts, and especially to in-car audio, makes it clear how complex the quest for a winning edge has become in stock car racing today. Seemingly tiny chassis changes or tire pressure adjustments can be the difference between winning and losing races and ultimately winning or losing championships. “The problem in the past has been I had three different brands of race cars,” Quarterley said while signing autographs for race fans at the recent Racearama trade show in West Springfield, Mass. “By the time I got them together, got the season started, and got them sorted out, it would be July. From that moment on we would be competitive everywhere,” he continued. “This year there’s all the same race cars with the same snouts, so hopefully we’ll be able to roll out for the first race, maybe not to win it, but to be able to stay in the top five. That’s what it takes to win the championship,” he declared. Both his new cars and the updated front ends for his existing cars come from the Hess Racing shop in North Carolina. 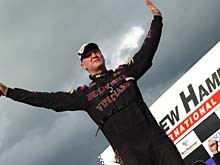 NASCAR Grand National Division, Busch North Series driver Dale Quarterley enjoyed his best season in 2004, scoring his first two superspeedway victories and finishing a close third in the final standings. Aiming to contend for the title in 2005, he has taken the expected steps, including building a new shop and acquiring new equipment. He’s also identified unnecessary complexity as one of the obstacles to a title run, and he’s moved to simplify his work load off the track in the expectation that it will improve his performance on the speedway. Along with the new rolling stock is a new shop in Westfield, Mass., replacing the former quarters which were literally in his back yard. “The shop’s up and running. Like everything else you try to critique it a little but it’s 90 percent done,” Quarterley noted. Joining him in the new shop will be fellow Westfield resident Jeff Anton, who ran two races last year and hopes to compete more regularly in 2005. Anton share a background in motorcycle racing, although Dale was a road racing specialist and Jeff concentrated on motocross. With the new shop and expanded schedule come expanded personnel needs, a project Quarterley is just starting to tackle. “We’ve got a B-team we’ve put together with some new guys for the second car. My team lost its lead mechanic, Mike Sibley, when he was hired by Joe Gibbs to run Bobby Labonte’s Busch deal so he’ll have to be replaced,” he said. “At the moment I’m just doing it myself, but we’ll put somebody in that place come race season,” he added, reflecting the hands-on style he shares with three-time defending Busch North Series champion Andy Santerre. Fontana (Calif.) because I like the speed. We’ll see what happens,” he added.